Where living has to be larger than life and the best amenities accessible within the blink of an eye, Alien’s– ‘Elite’ is the answer you are looking for. Positioned near the IT heart of the city in Miyapur, Elite is surrounded by the newly developed shopping, restaurant, entertainment and leisure precincts in and around it. Project elite tastefully designed with materials to achieve optimum design potential. Natural textures and stylish neutrals, encompassing bone white, charcoal grey, brushed metal and translucent glass, refract the interplay of light. A modern club house, squash & tennis courts and other indoor/outdoor games facilites is planned with in elite. 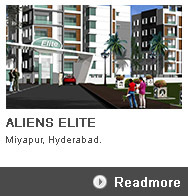 Convinence stores, commercial space, atm's etc are the other utility features at Elite. Currently the '1st phase' is complet with handovers and progress.